Part of the Family & youth activities category. Join us on Monday, October 1st to meet and mingle with other homeschoolers from across Virginia! Participate in activities for all ages, including guided workshops and gallery walks, as well as self-guided crafts, games, and scavenger hunts. Participation is free for homeschoolers and chaperones, but registration is required. Students will divide their time between our galleries and classroom in this program that uses clothes from our collection, historic photographs, and replica artifacts to learn about famous Virginians and important periods in Virginia’s history. Participants will be able to draw conclusions about life in the past versus the present and talk about why individuals and communities lived, worked, and dressed different. In 1849, John Robertson Maben traveled to California in search of gold. In a series of thirteen letters, Maben describes his travels to his wife, Sarah. These letters are especially vivid because Maben was witness to events both momentous and mundane. He wrote of the cholera epidemic of 1849, the great St. Louis fire that same year, and the excitement and brutality of the California gold fields. In this program, students will join Maben on his journey, interpreting his letters, tracing his travels on a 19th-century map, and examining the landscape. The program will also incorporate time in the westward expansion area of our Story of Virginia gallery. Though the Civil War is often called “the first modern war” in terms of technology, medicine had not yet caught up. More soldiers died of disease and infection than from battle wounds in the Civil War. This program examines doctors, nurses, and patients in both the North and South and how they dealt with sickness and injury. Students will walk through a gallery display on Civil War medicine, analyze primary sources, and participate in an interactive program to help diagnose a sick patient and treat them for their ailment while also learning how surgeons completed wartime amputations. 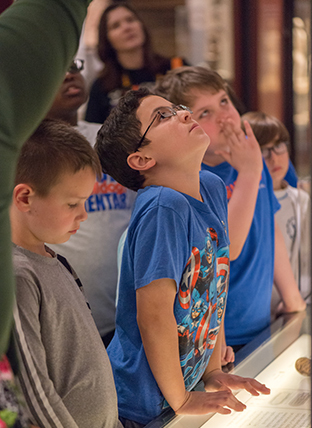 Students will tour museum galleries to see and analyze how sources and artifacts are displayed to best illustrate the history of colonial Virginia and the Revolutionary War. The classroom portion will allow students to “curate” their own pop-up exhibit, as they think about and explain the items they would choose to represent this topic. Please contact the Group Tour Coordinator, Maggie Creech, at mcreech@virginiahistory.org or 804.342.9652 to register.